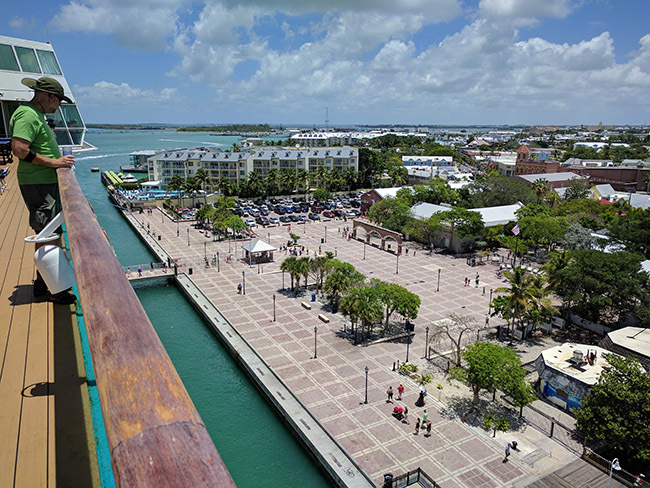 Today was our first full day on Empress of the Seas, and we spent it in Key West. The timing of our arrival was a bit odd, and we broke away from what we usually do in this port. Let's review the day and look ahead to tomorrow, which is sort of the "main event" in Cuba. 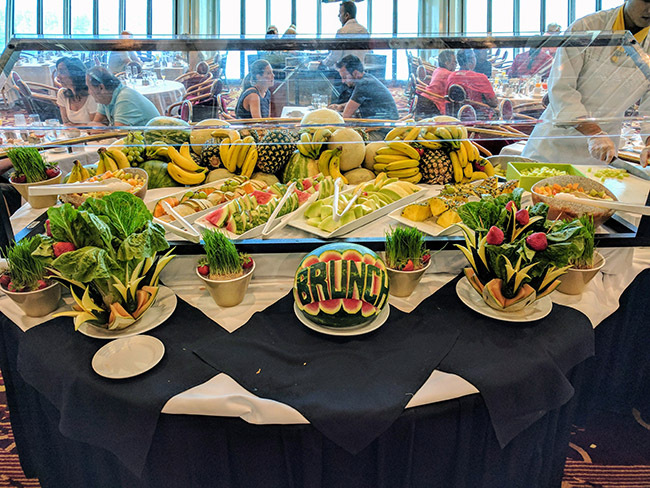 You may have heard about brunch on Empress of the Seas which includes a wide variety of options and complimentary mimosas. In the past I'd only seen this on sea days, but last night we were informed there would be brunch today, which made a lot of sense as we weren't scheduled to arrive in Key West until 12:30pm. 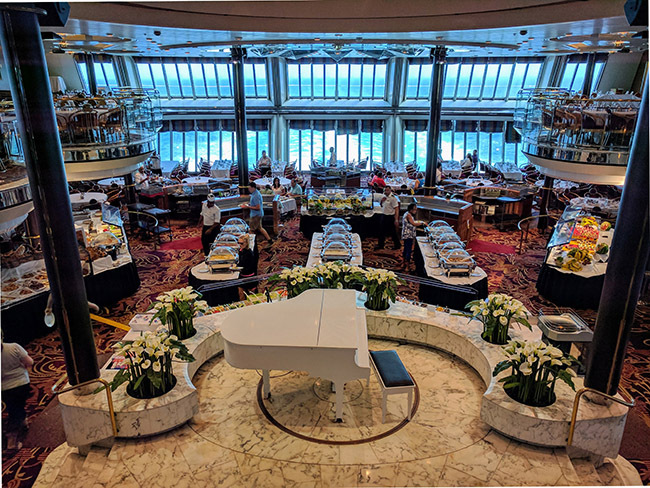 The buffet-style meal is held in the main dining room, which I mentioned in yesterday's blog, is quite pretty. In the center of the room on the first floor had hot stations with various breakfast foods as well as cuts of meat. There was also several soups, a waffle station, pastries, fresh fruit, dessert items, and more. While there wasn't a menu present, they seemed happy to accommodate requests from several guests. For example, I asked for two eggs benedict without ham, and they seemed happy to help. Mimosas were offered up, which was a nice touch, though we purchased the drink package on this sailing, so it didn't move the needle for us. Overall I liked this a lot better than the breakfasts we had in the main dining room on other Royal Caribbean ships. After brunch we headed to the theater to catch a presentation that was being given about the process tomorrow. It was largely about the documentation, Cuba's two currency system, and a few local tips. 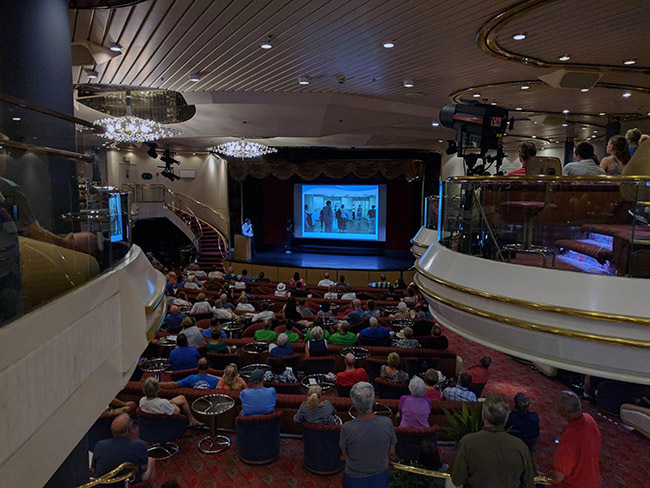 It was probably quite useful for many passengers, and we're just going to assume that Royal Caribbean did a great job reading our Cruising Cuba series where we covered a lot of this information. The morning's leisurely pace continued as we waited to clear the ship in Key West, which didn't end up happening until 1:00pm. One nice thing about a small ship is that usually a late arrival in port would leave large crowds waiting at the gangway, but on Empress these crowds subsided very quickly - and about 15 minutes after being told we could disembark we walked down a few decks and strolled right into Mallory Square. The location was another win, as ships sometimes dock at the Naval Pier just down the way. This isn't a huge inconvenience, as shuttles take you right to the square, but docking right in the heart of Key West is really nice. Usually when in Key West we buy tickets for the Old Town Trolley Tour. It's just been an easy way to get to all the hot spots, includes a bit of narration, and offers up some discounts to local attractions. As mentioned yesterday there are discounts available, but the cost I saw today was about $27/person. Today we didn't do this, not because I don't think it's a great way to get around, but because it was terribly hot, and we were pretty sure we were just going to grab a drink someplace with good a/c and head back. 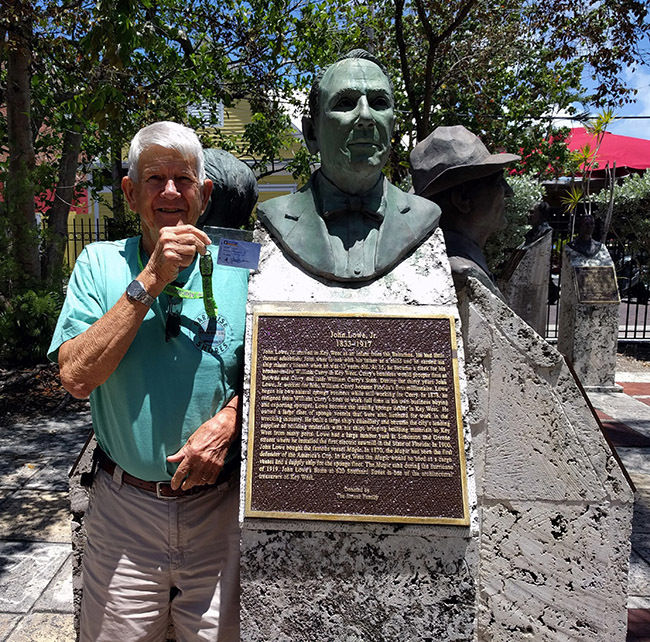 As we approached the cornucopia of bars we stumbled upon a garden of busts of people of historical significance to the Conch Republic (Key West). This was neat enough, but then another Empress guest said he was there to say high to his grandfather, John Lowe, who's bust was present. Below you see Charles Lowe (holding his SeaPass showing his name indeed matches up) standing next to his grandfather. We first visited The Patio, a bar Larissa had been to in the past. They're largely known for their hand-crafted cocktails, but this section didn't open until 5:00pm. 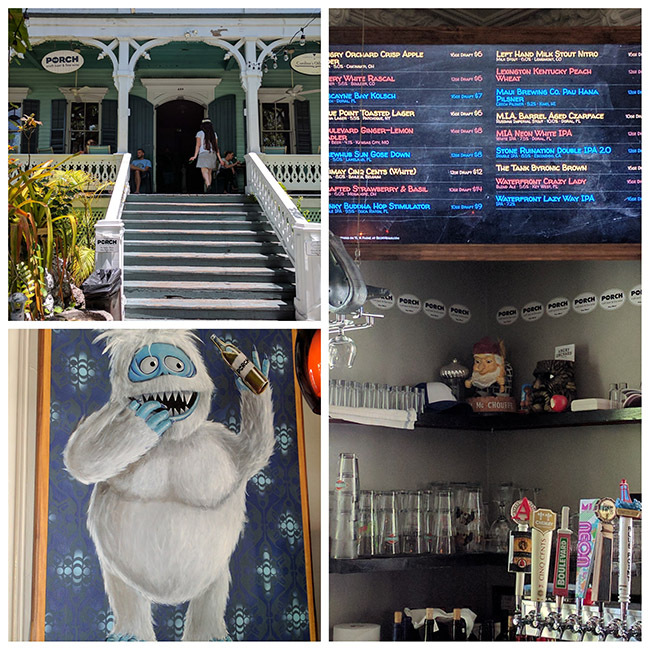 Luckily they had a good craft beer selection that was ready (as well as wine and such), and we enjoyed some local company who suggested we grab a bite just down the street at Mary Ellen's. We each had a beer and Larissa had a mimosa - the prices were quite reasonable as it was 2 for 1, and their beers were not "Key West tourist" prices, which was nice. Oh, this place had some great pop-culture references on the walls - it had neat character and we wish it would have been cooler so we could have enjoyed the outdoor seating. Strolling a few blocks away to Mary Ellen's we were ready for a snack. 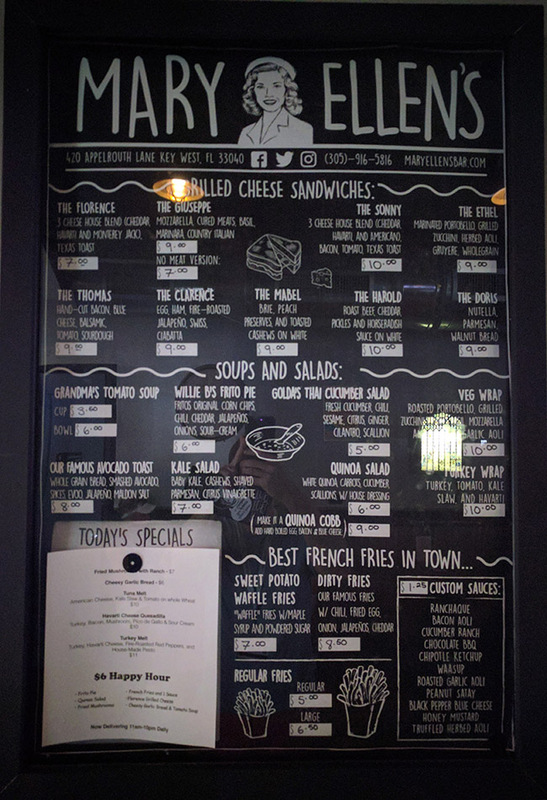 The locals at The Patio promised good quality and creative grilled-cheese sandwiches and crispy fries with dipping sauces. This made me think of the potatoes you find in the Netherlands, so I was excited. We ended up having a few drinks there as well, and enjoyed fries and grilled cheese that lives up the the promise of the locals down the street. Definitely sneak in here for good bar service and great food. 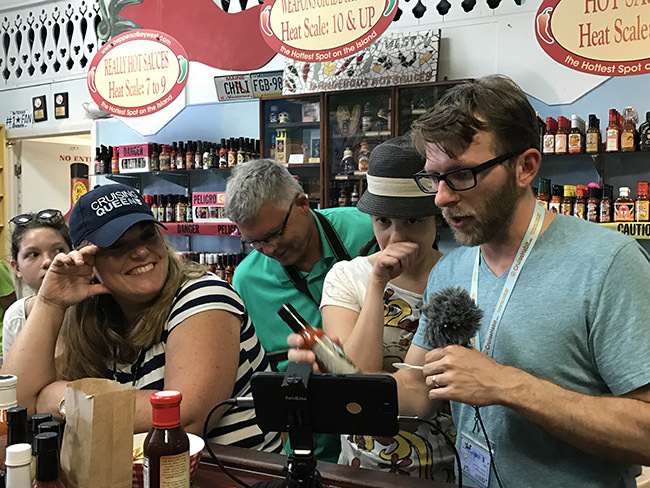 Our next stop was Peppers of Key West, a store off the square which sells loads of interesting hot sauces, rubs, and other items for "chili heads". We've been fans of this place for years and always stop by. 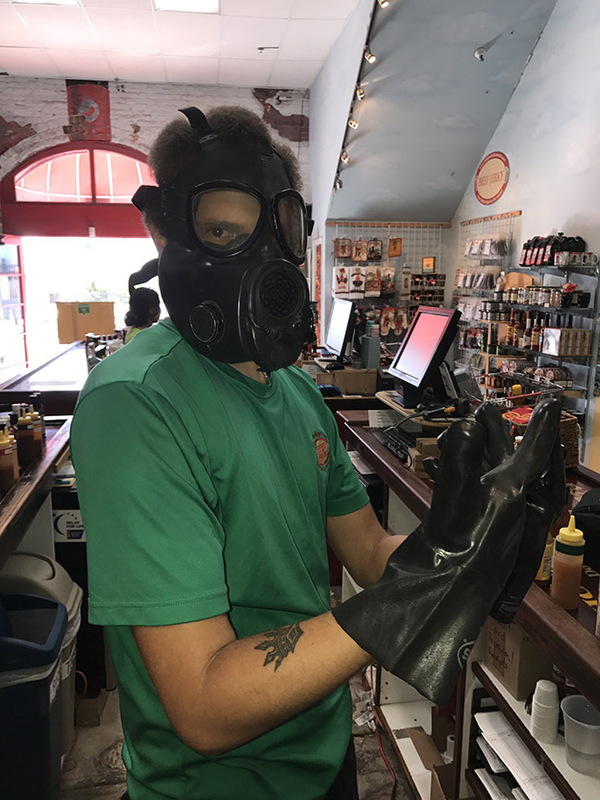 Don't be deterred just because you don't like spicy stuff - the staff knows their stuff and will guide you towards marinades and such that may not be spicy at all. 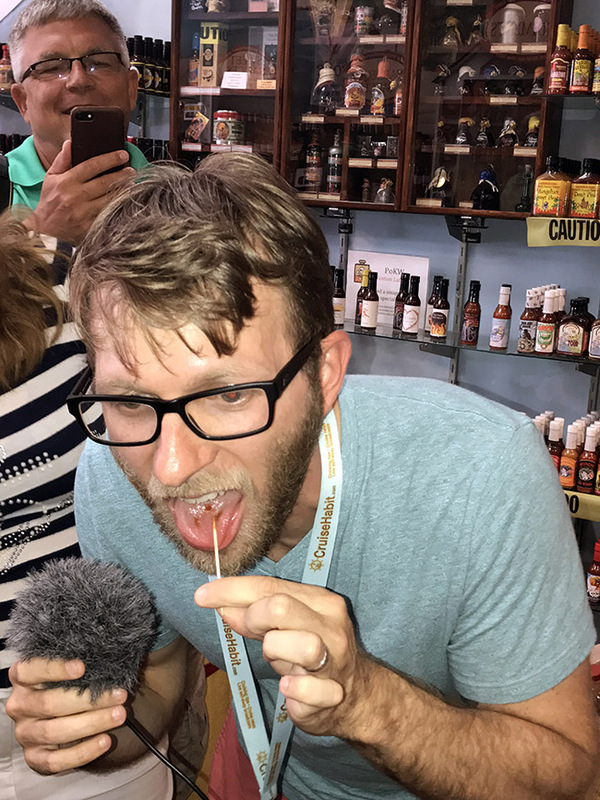 They have many sauces which you can sample, so we did a bit of a tour and worked up to their hottest sauce they had available for sampling, and then William, the gentleman helping us, even had us try a capsaicin extract (the stuff that makes peppers hot) which comes in at 1,000,000 Scoville units. For a frame of reference jalapenos come in at between 2,500 and 5,000 Scoville units. We did this whole tasking on Periscope, and I recommend you check it out as we had a lot of fun - Kat from rcperiscopers.live even joined in on the fun! 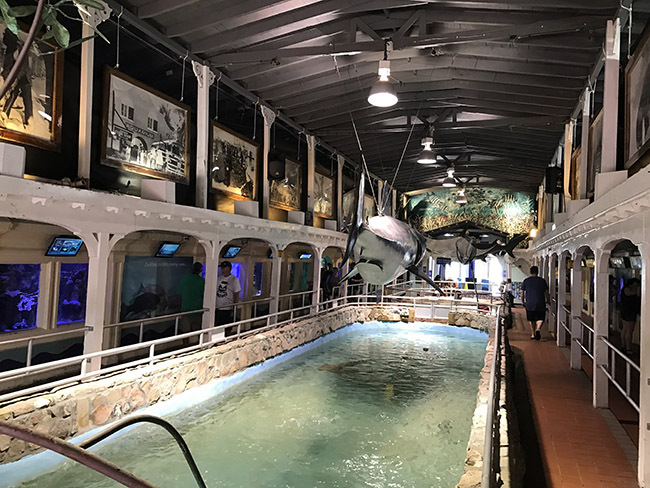 I should mention that Kat and her family opted to visit the Key West Aquarium, which is right by the dock. They seemed to really enjoy it and I could see doing this sometime in the future - especially because it's so convenient. Tomorrow we're in Cuba, so I took the time to fill out our visas, put them in our passports, etc. 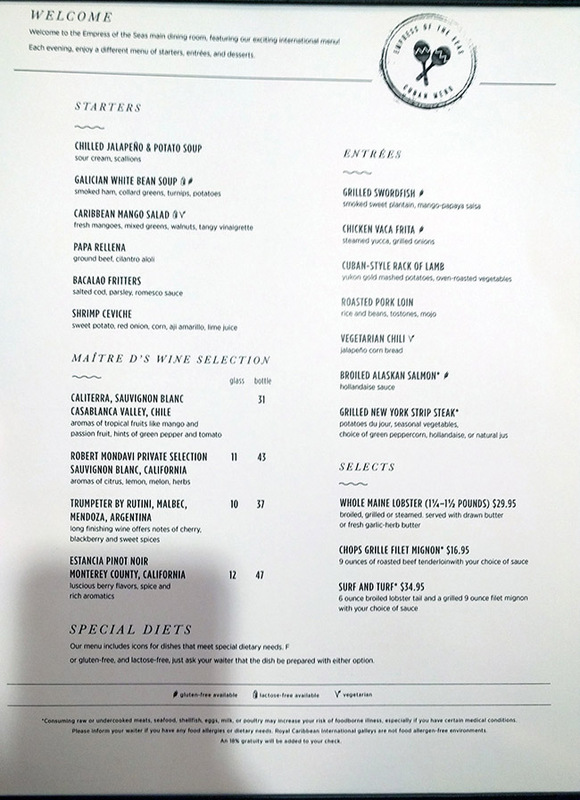 The ship was also getting guests ready as tonight's menu featured Cuban fare. Living in South Florida this wasn't the more novel concept, but guests seemed to enjoy it. I opted to have Indian food, which we requested last night, though I did enjoy the mango salad. I also enjoyed coconut flan for dinner, which combined two things I really love. We're meeting at 8:30am in Boleros tomorrow for our "walking" tour. I put walking in quotes, as if a large portion of your tour takes place on a bus and in a restaurant...is is still a walking tour? We'll see. After the tour we'll be exploring on our own, and I'm really interested in conversing with some locals to find how different (or similar) it is to interacting with recent Cuban expats back home in South Florida. The architecture and history of Cuba of course interest me, but it truly is the interaction with locals that is the part of tomorrow which excites me. Remember - we're sharing on Periscope, Twitter, Facebook, and Instagram - so follow along! Tomorrow's updates may be a bit delayed because staying in touch in Cuba isn't as simple as elsewhere, but we''ll share as soon as we can! Have a question? Reach out or comment below!